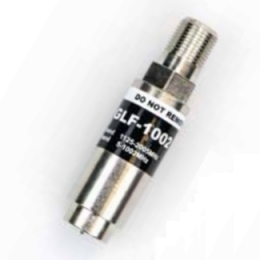 The ANTRONIX's MoCA "Point of Entry" filter Model GFL-1002 serves as in-home networking services pass through for the 5-1002MHz band while providing an excellent termination for the MoCA band from 860Mhz to 1525MHZ. The device physically isolates the subscriber premise by providing a band stop at the networks Point of entry "POE" This avoids interference from other MoCA users. The device provides a perfect termination for the MoCA band and reduces micro reflections that would typically reduce the data throughput. ANTRONIX MoCA filter is designed to remove any inference that would disable the AGC circuits of DOSCIS 2.1 or lower cable modem operations, The Filter is DOCSIS 3.1 compliant & ready to provide any services that will come forth in the future. ANTRONIX MoCA filter is designed for indoor use but has been developed to withstand internal pressure of +15 PSI. proA companion product, the GLF-1002S provides for the produict to be installed into an outside enviroment because of the rubber water seal aatached to the filter. The filter provides internal surge protection rated to surpass IEEE testing of 6Kv B3 Combo wave resistance. All ports comply to all existing SCTE standards; ANSI/SCTE 01 (formerly SCTE IPS-SP-400). Devices are designed to remain stable in environments of -40°F (-40°C) to +140°F (+65o C) and maintain all technical specifications. Metallic housing of the protector provides excellent EMI shield, effective beyond 100dB.